Oberleutnant zur SeeLudwig Forster, aged 26, was the next U-Boat commander to penetrate New England waters, however it was to be brief – of five days. The primary mission of his submarine, U-654, was to patrol the waters off Newfoundland and Nova Scotia, which he did. The track of the patrol shows a westward trajectory south of Cape Sable to a point inside the Gulf of Maine from the 24th to 25th of January, then a southward voyage to the 27th, and finally an exit of the region south-southeast of Sable on the 28th. Aside from participating in the Ziethen Wolfpack from 6 to 22 January and tracking Convoy ONS 61 700 miles east of Cape Race, not much was accomplished by U-654 during this patrol. It did however hit the Free French Flower-Class Corvette Alysse (K 100) on 9 February in the convoy, and it foundered the following day, with the loss of 36 lives. 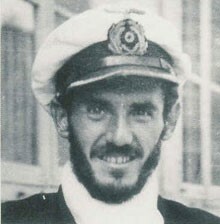 Born on 9 October 1915 near Dillingen, Forster was a member of the Naval Class of 1936. His career total was 3 merchant ships sunk and one naval ship destroyed (Alysse). Before serving aboard U-654 he was 2nd Watch Officer of U-29, and 1stWatch Officer of U-62. Most of Forster’s successes would find him on the next patrol, which was also to the Americas, and Forster orchestrated the destruction of the Empire Prairie, Steel Maker and Agra near Bermuda in April 1942. On his next patrol to the Caribbean U-654 made it to Panama without sinking any ships and the submarine was itself sunk east of Nicaragua and north of Panama on the 22nd of August 1942 by bombs dropped from a B-18 Digby plane of US Army Bomber Squadron 45. Forster and all 44 men aboard the U-Boat were killed.